Goswami Tulasidas was a saint, poet and has composed many devotional songs and Kirtans. He was the leading poet of the Bhakti movement and a great reformer of Hindu Society. His 'Rama-charita-manas' (1575) is the greatest work in Hindi Literature. It is considered as an immortal classic by all Hindus. 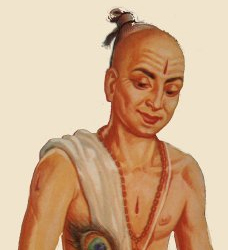 Tulasidas was the poet of common people. For all Hindus, Tulasidas was a symbol of religion, culture and true knowledge. Besides the religious importance, the poetic creations of Tulasidas are marked for their literary excellence. His other important poetic works of Tulasidas are 'Bairavi Ramayana', 'Parvati Mangal', 'Gitavali', 'Vinaypatrika' and 'Hanuman Chalisa'. Tulasidas was married, but later renounced worldly life and became a devotee of Lord Rama making pilgrimages most of his life.